The Emirates Group, comprising Emirates airline and dnata, has published the sixth annual environmental report outlining the Group’s environmental performance for the financial year 2015-16. The report, audited by PricewaterhouseCoopers (PwC), presents environmental performance data and environmental sustainability initiatives from a range of Group activities covering airline operations, dnata’s cargo and ground handling businesses and other commercial activities on the ground such as engineering and catering. In addition to presenting the overall environmental impact the report aims to identify and feature best practices from across the Group’s workforce. Airline operations constitute the main environmental impact of the Emirates Group. Emirates operates one of the youngest aircraft fleets in the industry with an average age of just 74 months compared with the industry average of 140 months as of the end of the financial year. A modern widebody fleet not only delivers environmental benefits with regards to lower engine and noise emissions but also helps offer customers a higher level of comfort. Emirates’ flight operations specialists continued to work with air traffic management providers and airports around the world to deliver more efficient flight routings and operational procedures to help reduce flight times, fuel consumption and emissions. A number of operational improvements at Dubai International Airport also helped improve the consistency of the airline’s operations at its hub. However, regional volatility and airspace closure in several regions due to security concerns had an adverse impact on fuel consumption as a result of flights requiring longer flight paths to avoid these areas. One of the most significant developments of the year was the installation of a one megawatt array of solar photovoltaic panels at the state of the art Emirates Engine Maintenance Centre in partnership with Dubai Electricity and Water Authority (DEWA). The array is made up of 2,990 photovoltaic panels which are expected to generate over 1,800 megawatt-hours of electricity every year, helping save around 800 tonnes in carbon dioxide emissions. Other energy efficiency initiatives undertaken across the Emirates Group included the replacement of lights used for aircraft cabin maintenance with energy saving LED lights by Emirates Engineering and a comprehensive refurbishment of Emirates’ London office with a focus on energy efficiency leading to an overall reduction of 60% in electricity consumption. dnata’s cargo operations in Brisbane and Sydney achieved a reduction in power consumption through energy efficiency best practices and by upgrading their lighting systems. In addition to supporting ongoing wildlife conservation efforts in Dubai and Australia, Emirates partnered with United for Wildlife to raise awareness about the devastating effects that illegal trade in wildlife and wildlife products is having on the survival of some of the planet’s most endangered animals. United for Wildlife is a global collaboration unifying the efforts of seven of the world’s most influential conservation organisations and The Royal Foundation of the Duke and Duchess of Cambridge and Prince Harry. 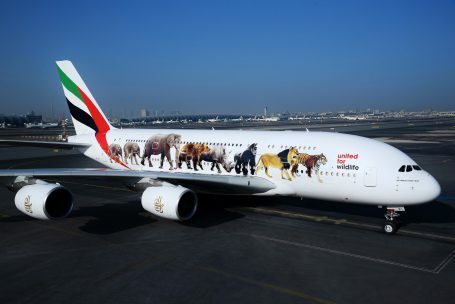 Emirates literally took the message against illegal wildlife trade to the world by installing special livery featuring endangered wildlife on four Airbus A380 aircraft as well as on a 1:3 scale model A380 installed on the roundabout at London Heathrow airport.